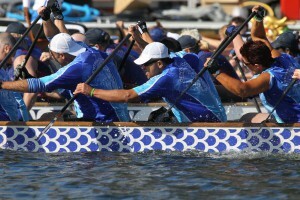 The Sea Dragons are the Central Coast Dragon Boat Club’s race crew. We are a competitive team who train hard, enjoy being on out on the water and like to have fun too. We regularly achieve strong placings at the NSW & Australian titles. We compete in Open, Women & Mixed races in several age divisions, with our strongest areas being the Masters (over 40 years) and Grand Masters (over 50 years) divisions. We paddle throughout the year with a small break in May at the end of the racing season.